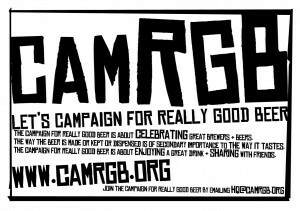 CAMRA turned 40 in September this year and this notable anniversary was met with events celebrating this fact up and down the breadth of the country. Actually that wasn’t the case and only two branches to my knowledge organised something to commemorate this event. One each in London and my local East Bedfordshire Branch. 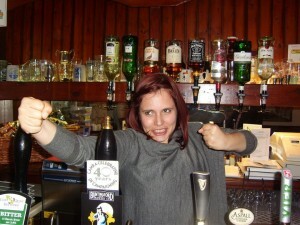 The Branch invited eight local pubs that appear in the Good Beer Guide to participate and the gist was that there would be 70 beers from 40+ breweries spanning the four decades of CAMRA’s existence available. 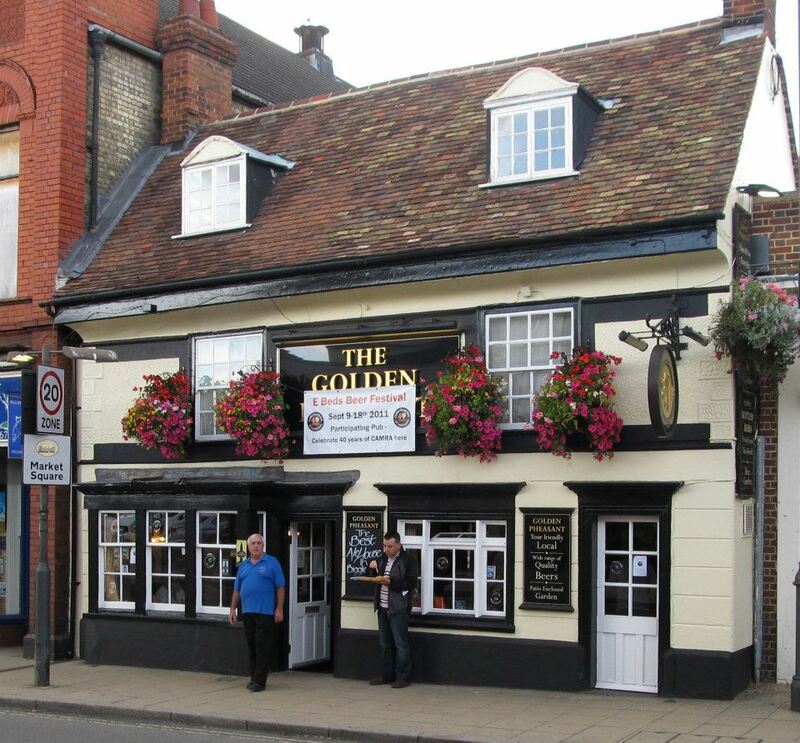 Even better was that on the two Saturdays that the festival took place a coach was hired to take us from one pub to another which for a non driver like myself was a chance to visit pubs in the villages surrounding Biggleswade which I would never have a chance to do so otherwise. 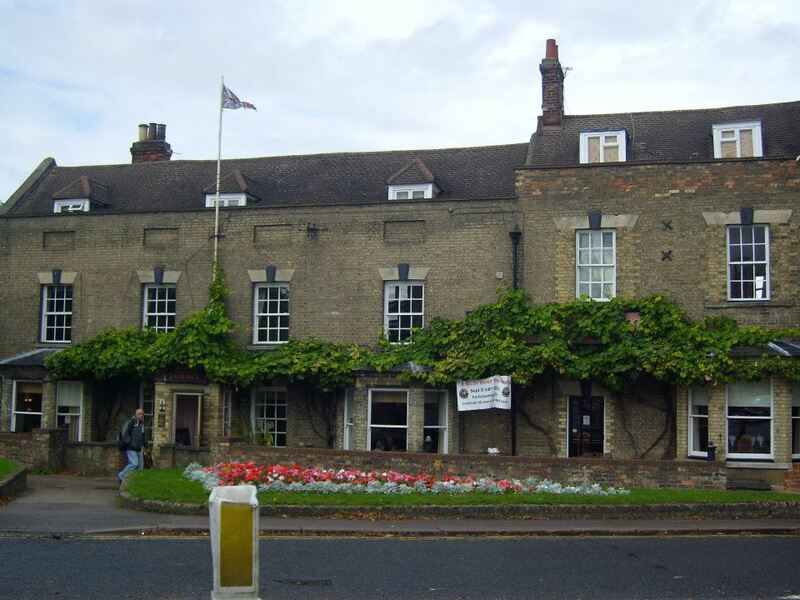 Luckily the Saturday we chose was gorgeous and we assembled in the Stratton House Hotel (Freehouse) which I consider to be the second best pub in Biggleswade. Believe me there is a real big drop off between first and second but the Stratton has made great strides in the past year hosting two excellent beer festivals and increasing the pumps from three to four which are now sparkler free! 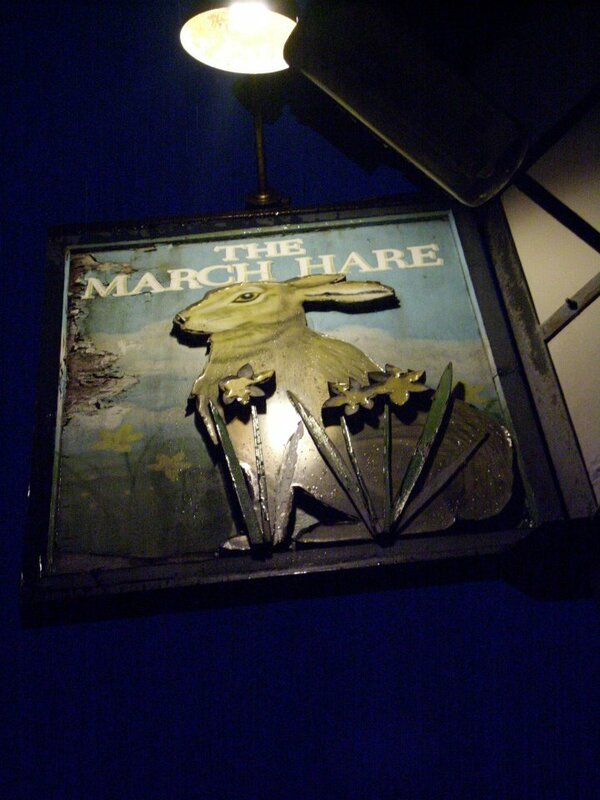 We introduced ourselves to the branch (to my shame I haven’t been to any branch functions in the three years that I have lived here) and grabbed a pint of Mauldons Silver Adder (4.2%) which was a perfect start to our jaunt being a lighter version of it’s far weightier brother White Adder. 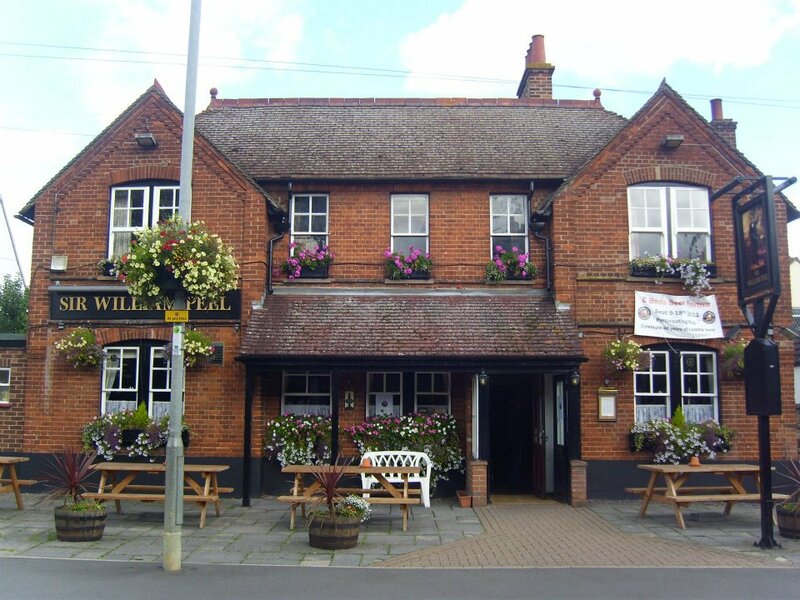 We were quickly rounded up onto the coach and made our way to the nearby village of Sandy and a pub that I have frequented before, The Sir William Peel (Freehouse). We sat in the sunshine sampling the wonderful Endless Summer (3.4%) from the excellent Oakham Brewery. It was a excellent pint worthy of another. I also tried Nethergate Azzaparrot (4.2%) which despite it’s premise of grapefruit and citra hops was a disappointment. 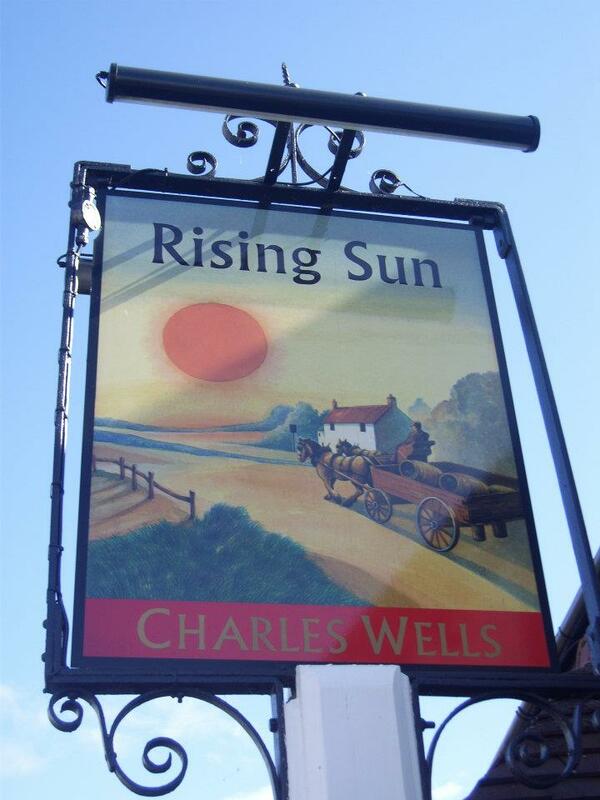 Still I didn’t have long to dwell on that as we were back on board the coach making our way to the town of Potton and the Charles Wells owned Rising Sun. Here we were greeted with 10 handpumps (they normally have six) with the brewery giving the current licensees plenty of leeway with their choice of guest beers. I had an excellent pint of Croeso from Pontypridd which was a tasty 4.2% blonde beer. This was quickly followed with another Oakham beer, the limited edition Mushashi (4.4%) which was a Japanese style beer brewed with green tea! The pub was interesting complete with an indoor well (how do they change the light bulb?) but it also had a strong emphasis on the food side of things which I guess would restrict drinkers to the slightly raised area at the bar when the place was busy. 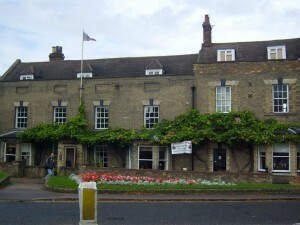 We were on the move once more to the John O’Gaunt (Freehouse) in nearby Sutton. This was a lovely looking pub with some great views over the countryside which we enjoyed whilst drinking yet more Oakham beer (I do like it y’know) this time being the JHB which is a fine pale session beer at 3.8%. 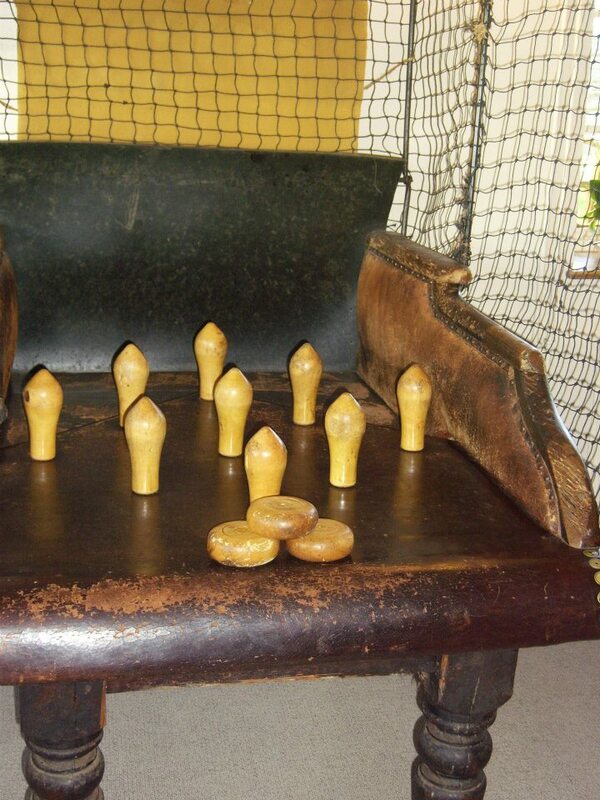 Away from the garden we explored the pub and managed to get a couple of games of Northampshire Skittles in. 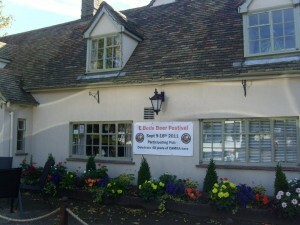 The pub has had a revamp and is tastefully decorated. Again there is a food side of things which is the norm in small village pubs I guess but it wasn’t so obvious as the former pub. It’s a pub I have marked down for a taxi ride too in the future. We headed back to Biggleswade and to my local The Golden Pheasant (Charles Wells). 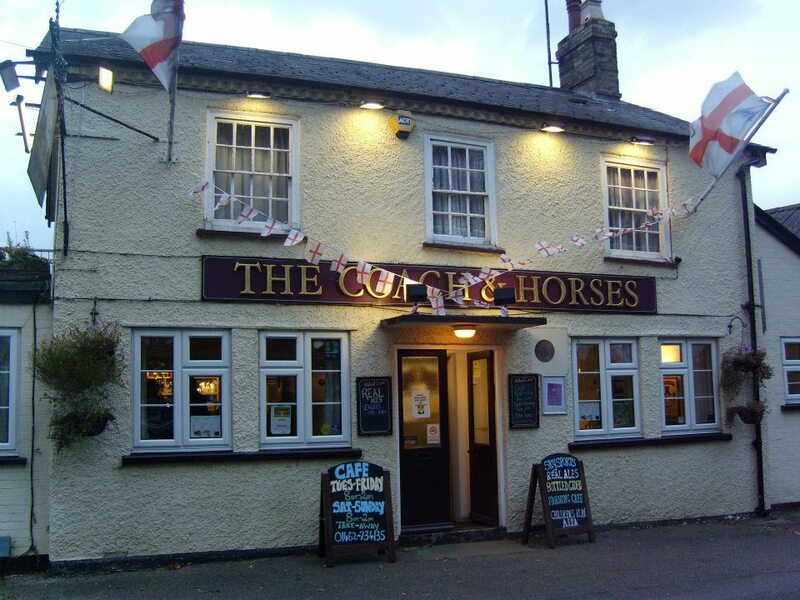 I intend writing a larger piece about the place soon but in a nutshell it’s a nice old fashioned boozer with six handpumps with two from the brewery and the rest sourced by the landlord – within limits of course! I enjoyed a pint of my first “brown” beer of the day the incredibly drinkable Teignworthy Neap Tide (3.8%). This part of the day was supposed to be a chance to grab a bite to eat (do scratchings count?) but the jovial crowd supped halves and pints with unabashed abandon! 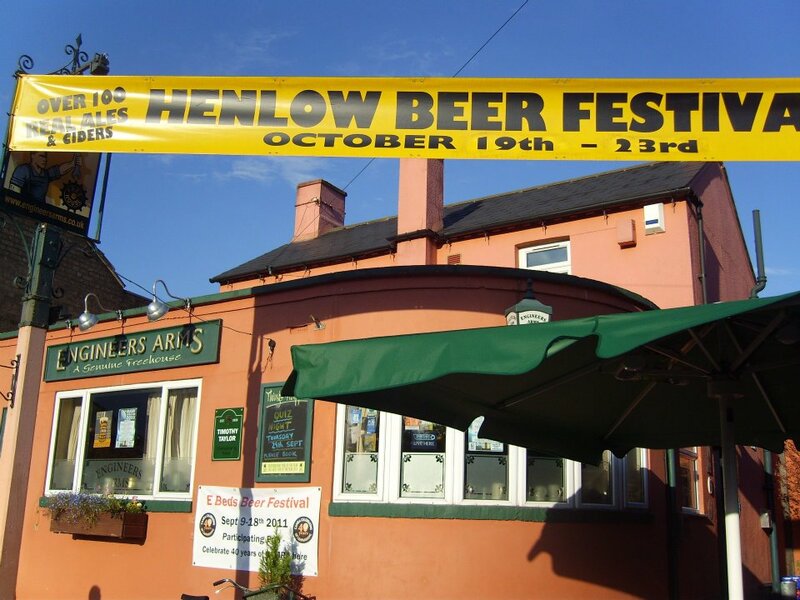 Before we knew it we were back on the coach and off to Henlow and the Engineers Arms (Freehouse) which was voted the branch pub of the year. It has over 10 beers available alongside a range of ciders and Perry. I had two Citra’s, one from Red Squirrel (3.6%) and Buntingfords version (4.%). I think the latter just edged it but both went lovely alongside our cheese and ham rolls. Not enough pubs sell rolls these days. Maybe we should launch a campaign to bring ’em back! 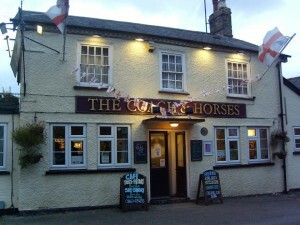 Our next stop was the days only disappointment in the shape of The Coach and Horses (Freehouse) in Stoffold. This pub was doomed to closure before being rescued by a local builder and some of the branch members were singing it’s praises before we got there. On arrival we found music blaring out for the benefit of one customer whilst the interior of the pub was very plasticity looking. By that I mean it looked like it was easy to wipe down the remains of whatever ended up on the floor at the end of the night and gave the pub a tacky feel alongside the posters for the forthcoming men’s appreciation night. Strippers to you and me…………….. The beer choice was limited to three handpumps and the unease in our group saw us restricting ourselves to halves of an unusually mediocre Hooky Gold 4.1%. The fact that most of us made our way back onto the coach ten minutes before we were due to depart rather than being rounded up as per usual spoke volumes. I really hope they can turn it round but in it’s current state it isn’t for me. The last pub of the day – well night now – was The March Hare in Dunton. 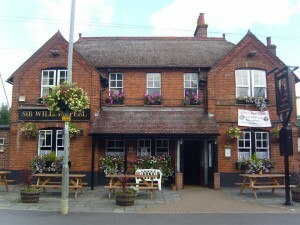 This pub was closed for a couple of years before reopening in August 2010. Again opinions were divided but this time more evenly. I didn’t mind it although it was quite” spartan” inside and there were no locals to be seen until we had been there for almost 20 minutes. We chatted to the barmaid who said that the pub is busy on Sundays, quiz nights and at other times of the week and given their opening hours this was understandable. As for the beer I had a very hoppy Keltik Magik (4%) followed by some Buntingford Oatmeal Stout (4.4%) which tasted as all traditional English stouts should. Very more-ish! That was it. We bundled ourselves onto the coach and headed back to Biggleswade for a nightcap or two at the Golden Pheasant. It was an excellent day out and I really hope the branch can organise some more events like this in future. A big thanks to all the pubs and for the branch committee for organising it as well as the long suffering coach driver. I hope he liked his glass – empty of course! 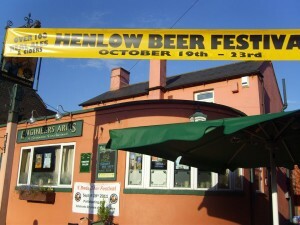 This entry was posted in Beer Events, Pub Crawl and tagged Charles Wells, East Bedfordshire CAMRA, Freehouse. Bookmark the permalink. is added I get four e-mails with the same comment. I’ll se what I can do.